There are so many things to do in Tbilisi that one week was definitely not enough, even though it was our second visit! Make sure you visit the awesome capital city of Georgia, the country, and check out all its amazing quirky tourist attractions! We visited Tbilisi for the first time in 2011, at the end of a 6 weeks overland journey from Italy, across the Balkans, all the way to the Caucasus. We had planned to ago hiking for a few weeks, before continuing onwards to Armenia, Azerbaijan and – maybe – Iran. 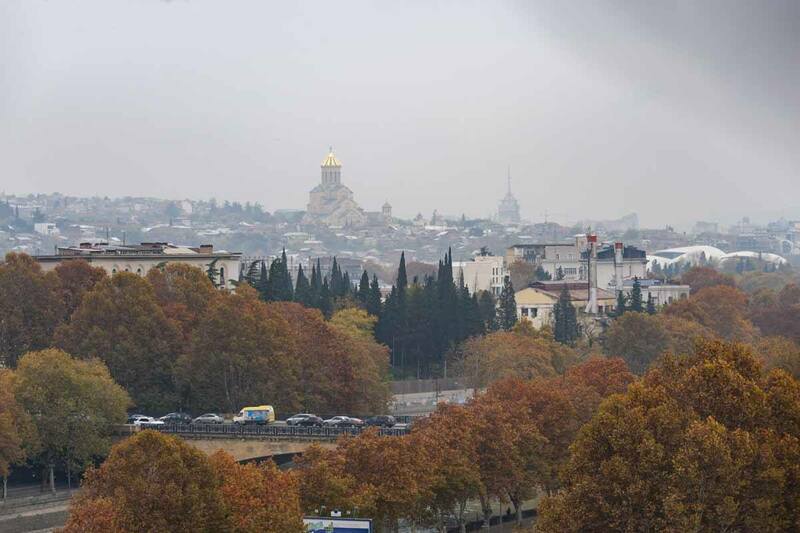 However, it wasn’t meant to be – a family issue meant that our journey came to an end in Tbilisi. We barely had time to see the city, but we liked what we experienced – the historic centre with its charming period architecture, the sulphur baths of Old Tbilisi, the botanical gardens and delicious Georgian cuisine. Fast forward 6 years, and I received an invitation to speak about ecotourism at the second edition of Touch Digital, a brand new conference about all things digital held in Tbilisi in November. I jumped at the chance – not only because I felt honoured to be able to speak at the conference, but also because that meant I could return to Tbilisi, and visit it properly this time. I ended up spending a week in Tbilisi – not enough to discover all there is to see and do, but enough for me to decide that I want to head back, and spend longer exploring this surprising, amazing city. 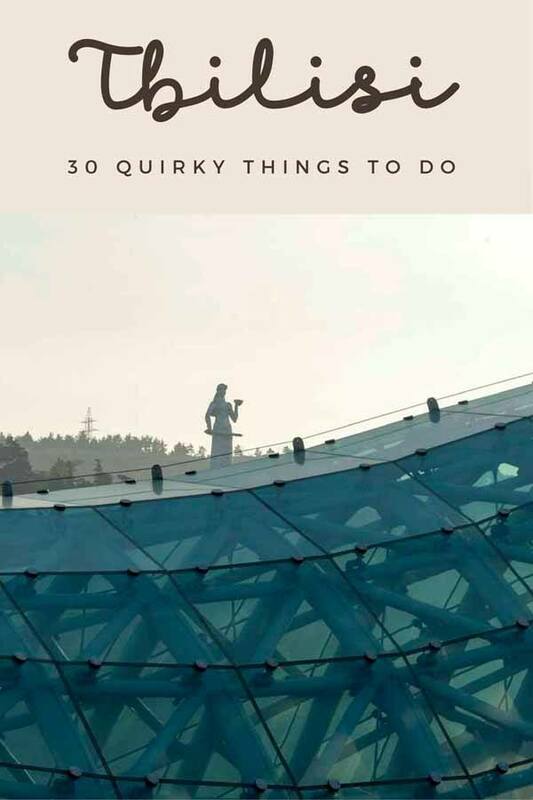 Here is my guide to the best things to do in Tbilisi, divided in four sections – the basics, quirky tourist attractions, the best Tbilisi restaurants and wine bars (oh, Georgian cuisine is SO AMAZING), and day trips from Tbilisi. Click below to jump to the relevant section! Tbilisi’s Old Town is the most obvious place to begin exploring the city. The Old Town is Tbilisi’s picture-perfect image, a maze of little streets with colourful houses, wandering cats and courtyards with trellised vineyards and cascading grapes – yes, you heard that right, grapes grow right into the city centre, revealing Georgia’s millenary love affair with wine. But more on this later! I know it sounds like a terrible cliche, but the best way to explore the Old Town is just wandering around – its rough boundaries are Liberty Square, the sulphur baths and Narikala Fortress, and it is built on the side of the hill leading up to the fortress, with steep rises and stairs leading up to spectacular views. There are churches, vintage shops, recently-restored houses fresh with colourful paint right besides crumbling facades with rickety spiral staircases and rusting cars in the courtyard. 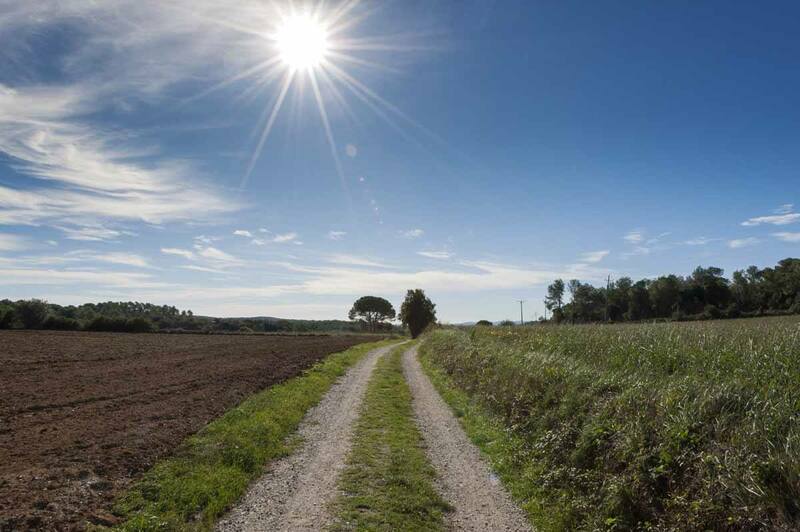 There are several sights to see in the historic town – but as I mentioned, walking around is half the fun. 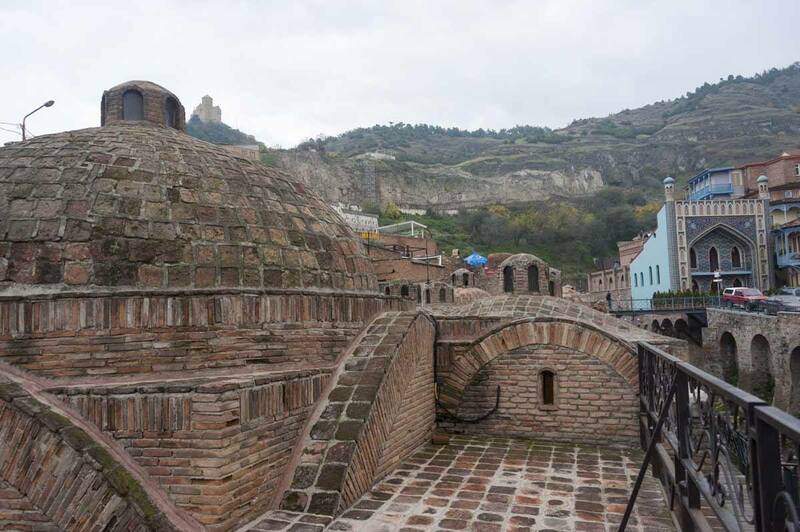 However, I recommend trying to find two unique Tbilisi attractions – the Jumah Mosque, the only one in the world where Sunni and Shia Muslims pray beside one another, and the Ateshgah, a Zoroastrian fire temple built in the 2nd century AD. Check out some of the best Tbilisi tours with local guides! 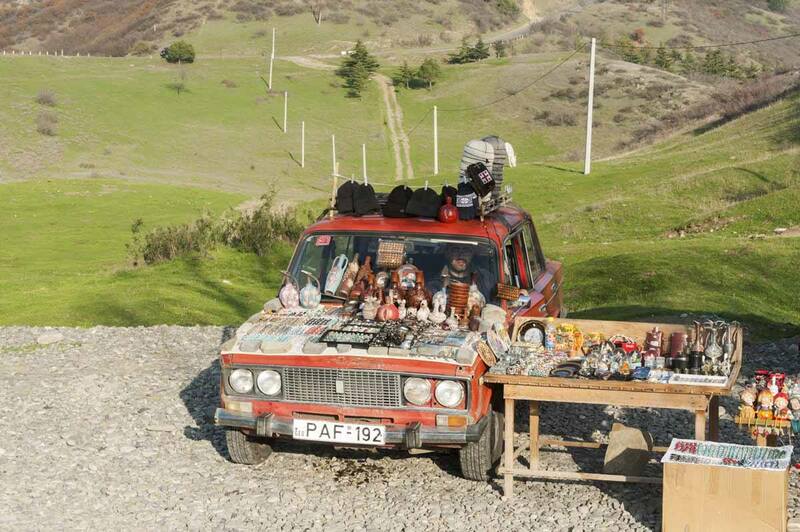 This is definitely Tbilisi’s not-to-be-missed tourist attraction! After all, the name of the city itself derives from the word t’bili in Ancient Georgian, meaning ‘warm’, because of the many sulphur springs found in the area. As you approach the Old City, the sulphur bath district is easy to find – just look for the brick domes you see in the picture below, and follow your nose! There are various bathhouses to choose from, and most offer a choice of public baths with male and female sections (with entrance costing about 5-10 GEL) or private rooms, costing 40-90 GEL per hour, depending on the room. A pretty thorough scrub and massage is charged 20 GEL extra – I went for it and found it really pleasant. I followed our guide’s advice and went to Royal Bath House, where a private room and massage cost me 80 GEL – about €25. Royal is open until midnight but some other bath houses are open 24 hours, making a sulphur bath an unusual way to spend a night out in Tbilisi! There are several Orthodox churches to visit all around Tbilisi – the two I liked best were the Betlemi Church in the Old Town, with a courtyard full of cats and beautiful views over the city, and Sameba Cathedral, one of the largest Orthodox churches in the world that can be seen from all over Tbilisi. Sameba Cathedral was built fairly recently, having been completed in 2004 to celebrate the 1500 years of the Georgian Orthodox Church and two millennia since the birth of Jesus. It’s a fair distance from the city centre but it’s worth the hike, to marvel at the sheer size of the building and views over the city. Looking for a truly off the beaten path Tbilisi tour? Here are some options! Another not to be missed sight in Tbilisi! The Botanical Garden is located between the Old Town and Narikala Fortress, and it only costs 2 GEL to enter. There’s a really nice cafe, a Japanese garden and lots of paths lined by beautiful secular trees – I visited in November and the autumn colours were in full swing. I really want to visit Tbilisi again in summer to swim in the waterfall located in the Botanical Gardens – sadly, the path leading to it was closed at the time of my visit. 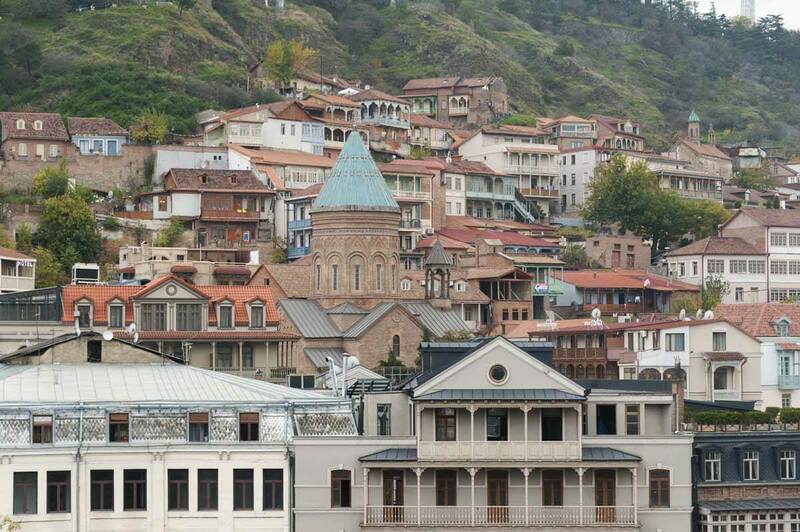 Taking the cable car to Narikala Fortress is definitely one of Tbilisi’s top things to do! You can catch the cable car at Rike Park, just opposite the Old Town across the Kura River, or walk up to the fortress through the city, following pretty Betlemi Street and then heading up until the summit of the hill. The fortress was first built in the 4th century AD, when it enclosed a Persian citadel, and it was extended over the century before being damaged by an explosion in the mid-19th century. Nowadays, two fortified sections remain and it it possible to hike to the top of both, but please pay attention as it’s extremely steep and slippery. Instead of walking or catching the cable car back down, there’s a zipline connecting Narikala to the Botanic Gardens – for only 30 GEL, this is by far the most thrilling way to move around in Tbilisi! 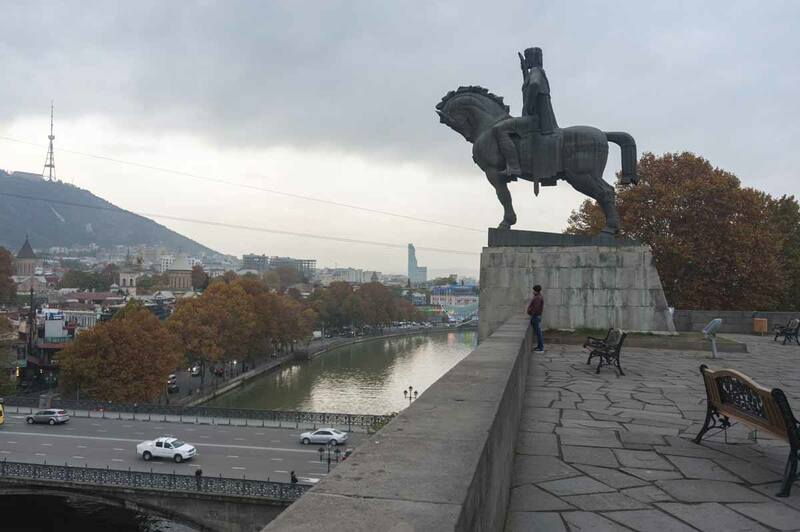 One of the few things I remember from my first visit to Tbilisi was visiting the giant Mother of Georgia statue, located right next to Narikala Fortress welcoming visitors since 1958. The statue is a great example of Soviet art, a 20 meter-high aluminium image of a lady crowned with ivy, holding a cup of wine in one hand (for friends) and a sword in another (for enemies). 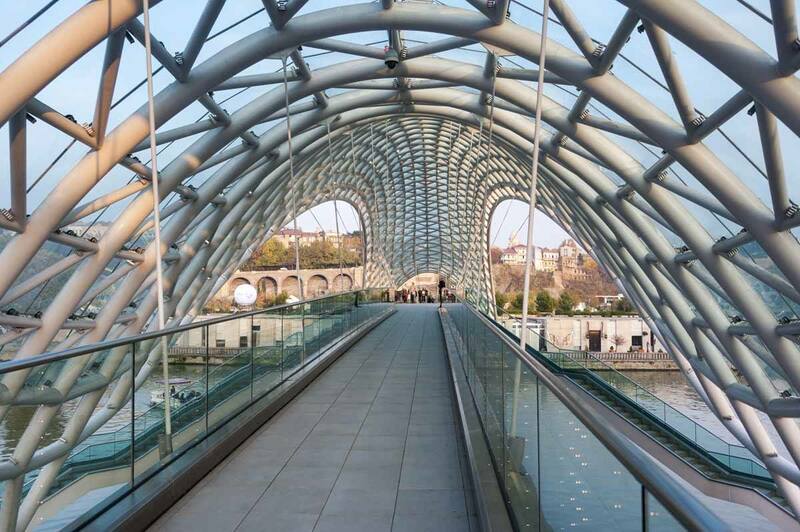 When we visited Tbilisi the first time, the whole Rike Park area was a big construction site – the reason was Peace Bridge, a bow-shaped steel and glass bridge spanning the Kura River, connecting the old and the new parts of town. It’s worth crossing the bridge around sunset, to see the sun disappearing behind the Mother of Georgia hill, or at night, when the bridge is all lit up in the colours of the Georgian flag. Busy Liberty Square marks the boundary between Old and New Town, and also the beginning of Rustaveli Avenue, the city’s most trafficked street, which also happen to be lined with some incredible early 20th century buildings, like the Biltmore Hotel, the Georgian National Museum and Rustaveli Cinema. Another place you’ll no doubt notice is the former Georgian Parliament, an impressive colonnaded building that was also the location of the April 9th tragedy, when 21 people were killed by Soviet troops during an anti-Soviet demonstration. Batumi is Georgia’s favourite tourist destination on the Black Sea, but it’s a bit far from Tbilisi for a day trip or afternoon getaway in summer. 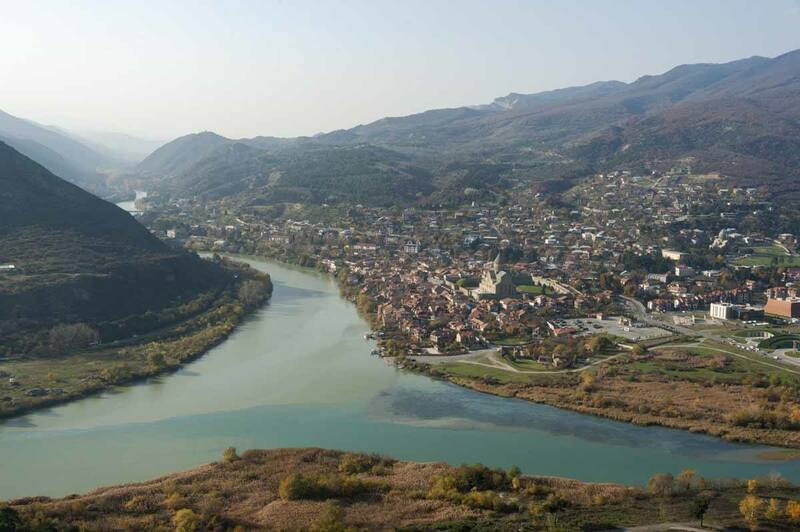 As a result, most city-dwellers head to the Tbilisi Sea or Turtle Lake, two reservoirs located on the edge of the city where swimming and sunbathing are allowed. Are you looking for the best views in Tbilisi? Mother Georgia is a good one, otherwise Mtsaminda Park is also a good bet – it’s located near the Tbilisi TV tower, the highest point in the city clearly visible from the Old Town. You can easily reach Mtsaminda Park by funicular railway, leaving just beside Rustaveli Avenue, zipping you up to the top in no time. You can also hike there, and we were told it’s especially beautiful in summer! Another reason to head to Mtsaminda Park is the vintage fairground that also includes a Ferris wheel – which leads nicely into the next sections, all dedicated to quirky and unusual things to see in Tbilisi! Since I started reviewing hotels in Milan, I’ve visited lots of amazing properties – and I can say without the shadow of a doubt that Rooms Hotel, in the Vera district of Tbilisi, is one of the best hotels I’ve ever stayed at. First, there’s the quirky, hipster-ish decor, with vintage wallpapers and furniture pieces, dark wooden floors and even lion-footed bathtubs in some of the rooms, and an atmosphere that combines the vibe of 1930s New York speakeasies with the charm of a decadent, aristocratic mansion. 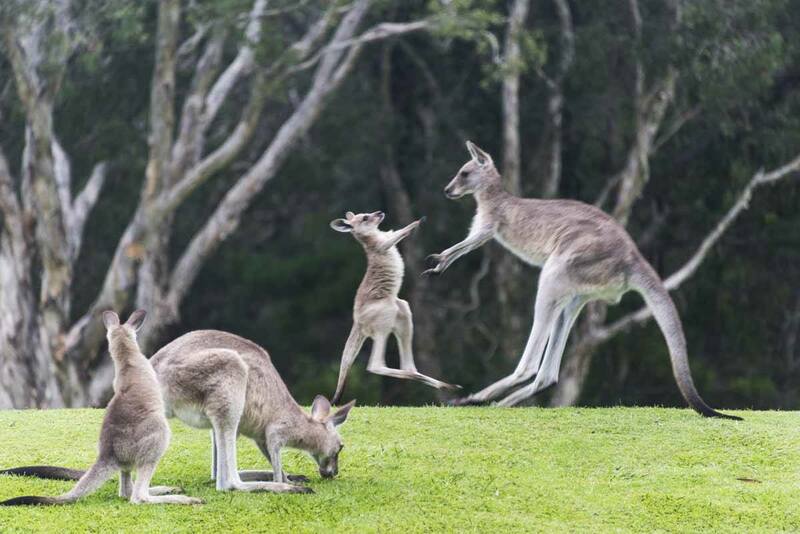 There’s also a lovely inner garden with a greenhouse, a great onsite restaurant and breakfast is literally to die for – a huge buffet with anything you can think of including eggs benedict, delicious mini-eclairs and homemade granola. Get the best prices for Rooms Hotel here! The Biltmore – a luxury property in a spectacular 1930s building on Rustaveli Avenue. Iota Hotel – a midrange hotel close to the centre, with a classy industrial-inspired design. Fabrika Hostel – you can’t miss visiting it! Apologies for the pic, it was taken from a car – but here’s the Bank of Georgia Headquarters! 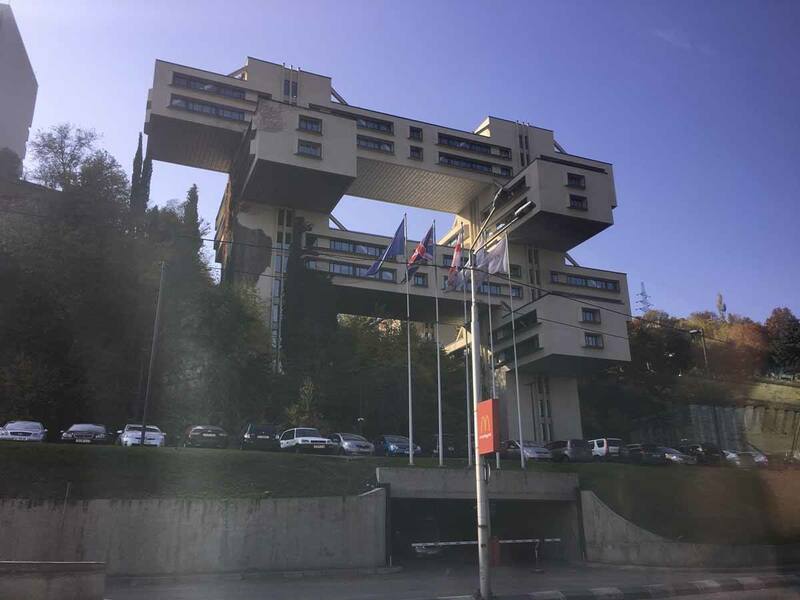 As a fan of Soviet architecture, I’m really glad I got to see the Bank of Georgia Headquarters, one of the craziest things to see in Tbilisi! The building is located south of the city centre, on the way to Mtshketa, and it is made with 5 separate cube-shaped modules layered on top of each other. It looks like… a Transformer? A crazy Lego jumble? A failed game of Jenga? You tell me. The most instagrammable place in Tbilisi! 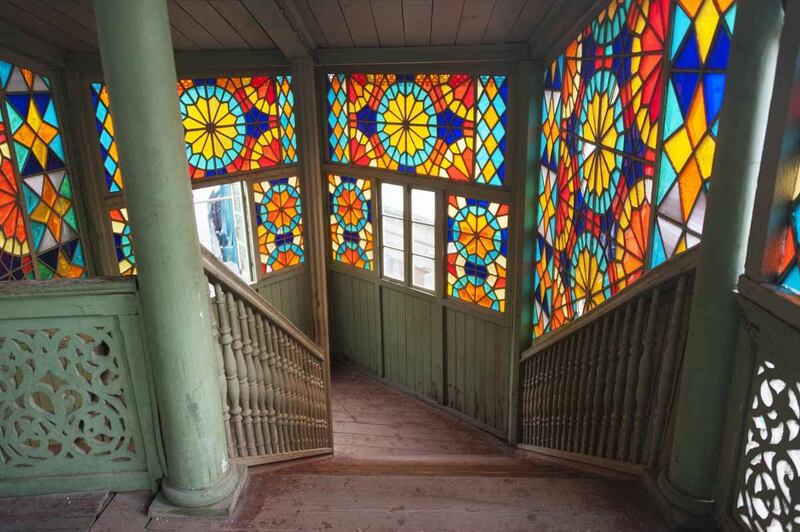 This Old City house definitely wins the prize of most Instagrammed place in Tbilisi – the stained glass and wooden staircase combo are reason enough to visit. However, please find time to at least browse the shop located on top of the stairs, selling a range of arts and crafts made by young Georgian artists, some of which make great souvenirs. Also, please bear in mind that locals live in this place, so don’t wander into their houses (stick to the staircase and terrace in front of the shop) and keep noise and chatter to a minimum. Wait… what? The Bank of Georgia is mentioned not once, but TWICE as Tbilisi point of interest? Well, the headquarters I mentioned above are all about the outside, whereas the Bank of Georgia Branch on Liberty Square is worth a visit because of its beautiful early 20th century interiors – but here’s a catch. Photography is not allowed, so I have no pic to share with you. Just trust me – and don’t try to take pictures, or you’ll be kicked out. The main hall is reminiscent of a theatre, with a gallery running all around the room, and if you walk through it there’s another spectacular room with a staircase, stained glass skylight and bright green walls. This Art Nouveau square was one of my favourite finds! It’s roughly halfway between Liberty Square and the Old Town, surrounded by crumbling but beautifully decorated buildings. It is a real local favourite – a sit-in was organised a few years ago to save the area from redevelopment, and the square is now popular with children, grandparents and anyone who wants to sit down and enjoy a moment of peace. I’m a fan of unusual hostels from all over the world, and even though I didn’t stay at Fabrika Hostel I spent an entire day there, as it was the venue of the Touch Digital conference. The hostel is located in a reconverted textile factory, including a coworking space, a cafe, many independent shops and some cool street art. The hostel bar is one of the best in town! Tbilisi’s ‘Italian Courtyards’ are everywhere, especially in the Old City – they come in various shapes and sizes, but usually include an opening enclosed on three sides by one or more houses two or more floors with open wooden balconies, and may or may not include a spiral staircase leading up to the various floors. Sometimes there’s a tree, or vines, laundry on a line, a child’s bike or a Lada in the middle of the courtyard – sometimes they’re immaculately kept, other times the courtyards are littered with weeds and old discarded objects. In case you were curious, there’s nothing ‘Italian’ about these courtyards – they’re actually believed to originate from Persian caravanserai. 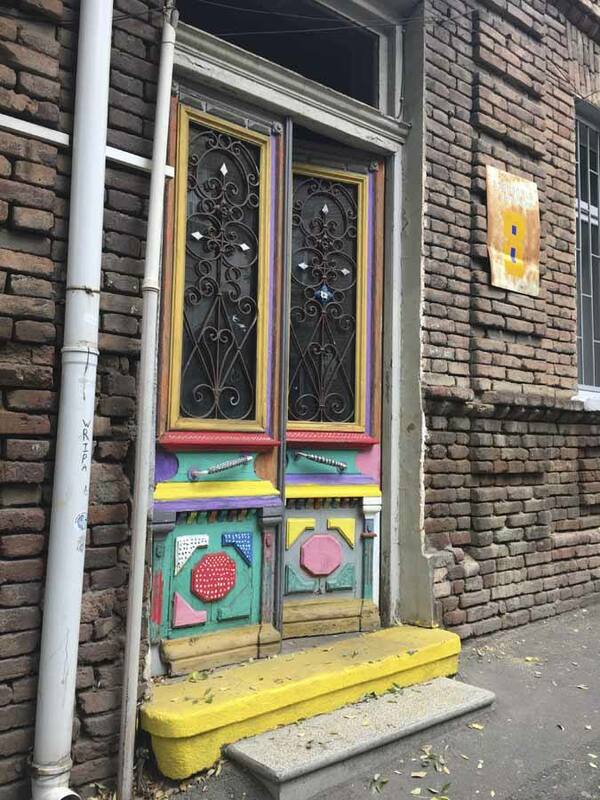 In any case, they’re one of the most unique things to see in Tbilisi! The leaning clock tower and nearby puppet show are a great option if you’re wondering what to do in Tbilisi with kids! It’s located right next to the theatre of famous Georgian puppetteer Rezo Gabriadze, with shows being held regularly. Are you looking for souvenirs? Are you planning to go shopping in Tbilisi? The Dry Bridge Flea Market should be your first stop if you’re looking for Soviet memorabilia, random knick knacks, prints, vintage cameras, coins, traditional jewellery, drinking horns, carpets… you name is. You can also find a similar array of antiques on Rustaveli Avenue, in the vicinity of the Rustaveli Metro Station, but the Dry Bridge Flea Market is definitely the go-to place for a unique souvenir! Are you looking for an alternative to the Old Town? The Vera District is my favourite place to stay in Tbilisi – the neighbourhood is located at the northern end of Rustaveli Avenue, and it’s worth a visit because of its park, ‘local’ atmosphere and beautiful 19th century architecture, including many examples of ‘Italian Courtyards’ and some great street art. Can you find the mysterious door? I spent an entire morning walking around Vera – this colourful door was one of my favourite finds. I can’t remember exactly where it is located – I think it’s in the vicinity of Simon Janashia Street, but I’m not quite sure. So, here’s a challenge for you – can you find it? The restaurant scene in Tbilisi is AMAZING to say the least! Bina 37 is one of the most unique restaurants I’ve been to – a ‘secret restaurant’ located on the 7th floor of a nondescript block of flats also conceals another surprise – it’s also Georgia’s only rooftop winery! The Georgian style of winemaking makes use of amphorae rather than oak barrels, following the ‘original’ winemaking style that was perfected in Georgia itself in the 7th millennia BC, and reached as far as Ancient Greece and Rome. The wine amphorae are located on the rooftop balcony, and the restaurant serves a tasty array of Georgian favourites including walnut salads, khinkhali (oversized soup dumplings) and khachapuri (the Georgian staple, bread with melted cheese). Guess where this restaurant is located? That’s right – its location right into the city walls give it a cozy, cave-like atmosphere, ideal for a long, lazy lunch on a rainy day. Make sure you order their delicious beef stew, garlic chicken and – naturally – khachapuri and khinkhali, washed down by copious amounts of amber wine! This restaurant is the kind of place you’d choose for a family dinner, or to entertain large groups of friends. The Georgian fare is on point, with uber-cheesy khachapuri, tasty stews and walnut salads, and there’s also an outdoor garden with a shashlik (kebab) grill. Food is great indeed, but the atmosphere is what makes this place special – there’s live music and lots of toasts led by the tamada, the ‘appointed toastmaster’ on each table. Located right next to the sulphur baths, this restaurant is easy to find thanks to its huge bread oven on the ground floor, welcoming diners with the sent of freshly-baked bread. The restaurant is in a nice period building, with wooden balconies overlooking old Tbilisi and entertainment provided by the staff, who will sing Georgian classics between one round of khachapuri and another. The name kind of gives it away – this relaxed joint on Rustaveli Avenue is one of the best places in town for khachapuri, which comes in all sorts of different shapes and size. Make sure you try Imeruli khachapuri, the most common kind, a circular ‘pizza’ topped with cheese, Megruli khachapuri, like Imeruli but with more cheese added on the top, Achma khachapuri, a cheesy lasagna with many layers, and my very own favourite – Acharuli khachapuri, a boat-shaped bread topped with cheese, butter and a raw egg to be stirred into the cheesy mixture. 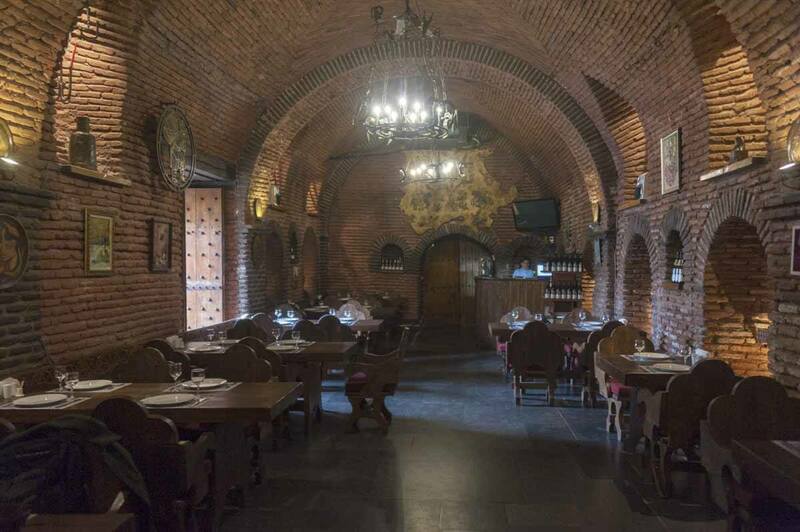 Located on the buzzing Erekle II street, this is the place to head to for all those who want to get to know Georgian wine and its peculiarities. The wine list is extensive and it includes several kinds of amber wine, a traditionally Georgian variety obtained by fermenting grapes with their skins. The waiters are friendly and knowledgeable and will be glad to help you choose a bottle based on your preferences. Book your Georgian wine-tasting tour here! This self-proclaimed ‘dive bar’ is anything but – it was opened in 2013 as the bar of Fabrika hostel, but it has since become one of the most popular venues in town for live music. The quirky decor, excellent beer and cocktail list combined with party atmosphere make it one of the best places for nightlife in Tbilisi. I am not a club person, but next time I visit Tbilisi, I definitely want to head to Bassiani, the city’s first techno club located in a Soviet swimming pool beneath Tbilisi’s Dynamo stadium. Clubbing is huge in Georgia and most people I spoke to seemed to really be into techno music, and mentioned Bassiani as the best club in town. It was called the Georgian version of Berghain, after the famous Berlin mega-club – minus the aggressive door policy. If you’ve been, please let me know! Here’s the view from the monastery! 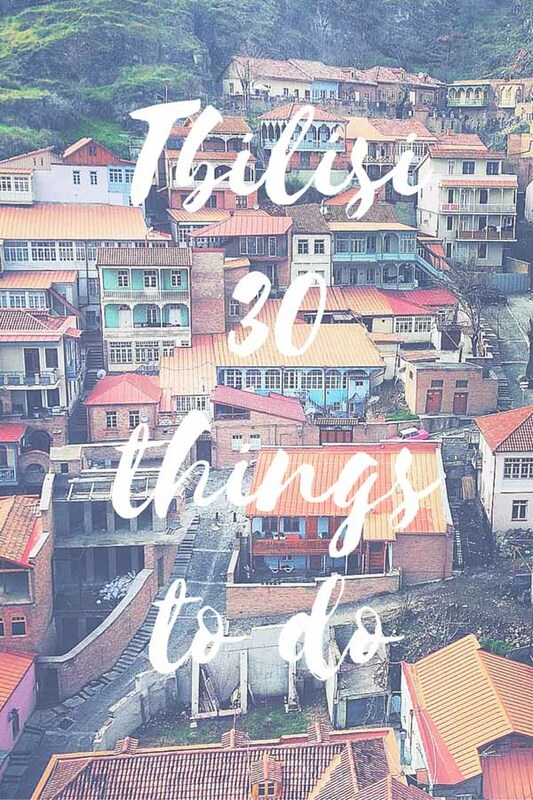 Visiting Mtshketa, Georgia’s ancient capital, is an easy day trip (or even half day trip) from Tbilisi, as the town is located only half an hour away from the centre. Mtshketa was built the confluence of the Aragvi river, and it served as capital of the ancient Georgian kingdom from the 5th century BC to the 5th century AD, and it’s now a UNESCO heritage site. We recommend starting your Mtshketa visit from Jvari monastery – you can visit the church inside, but the real draw of this place is the hilltop location, with great views over Mtshketa and the river confluence. After Jvari, the real star in Mtshketa is Svetitskhoveli Cathedral, one of the most important churches in Georgian Orthodoxy, famous for its spectacular frescoes and for being the burial place of what is believed to be Christ’s mantle. 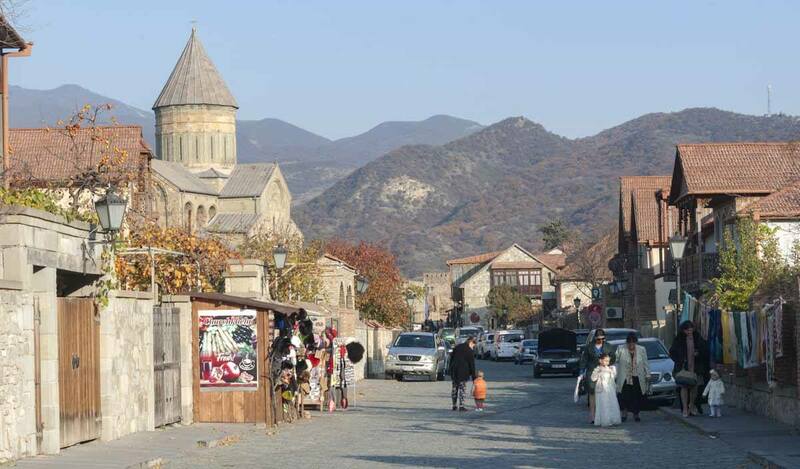 Don’t forget to spend some time wandering around Mtshketa and maybe do some souvenir shopping – you’ll definitely notice stalls selling bundles of Churchkhela, a candle-shaped sweet made with grape must or fruit juice, nuts and flour. Get the best prices for Mtshketa tours here! Have you ever heard of a man called Ioseb Jughashvili? If the name doesn’t ring a bell, perhaps you know him as Joseph Stalin? 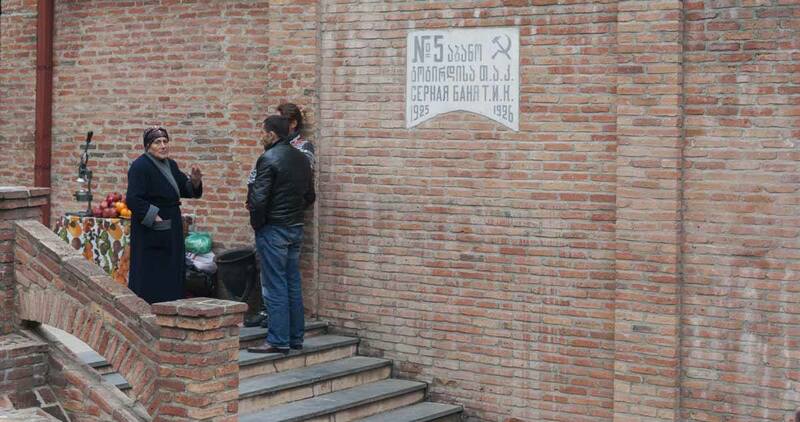 Not many are aware that Stalin was actually Georgian, born in Gori, a town not far from Tbilisi. Nowadays, Gori houses the Stalin Museum, where you can visit Stalin’s birthplace and get a ‘Soviet-style’ account of the dictator’s life, leaving out all the deaths and purges but emphasising instead on his leader qualities. Book your Gori tour here at the best price! Many thanks to Touch Digital and the Georgian Tourism Board for sponsoring my stay in Tbilisi! Thank you for such an in depth article on Tbilisi!! Great stuff, pinning it to my Georgia board immediately. Thank you so much Jaime! 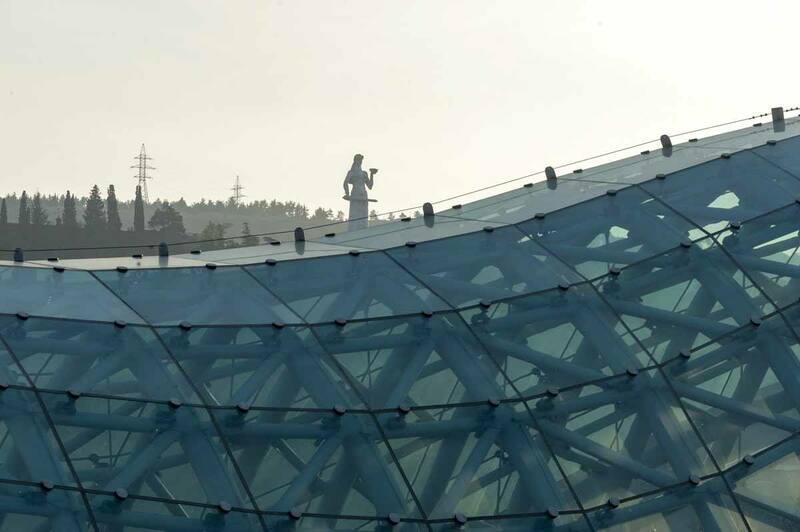 I’m glad you liked the post – Tbilisi is amazing!